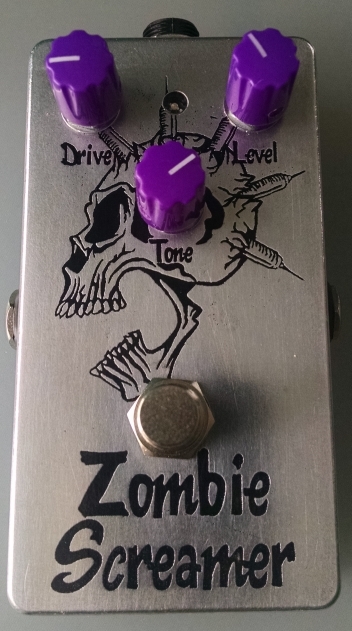 My Zombie Screamer is really good for heavier overdrive sounds but I wanted to design a simple overdrive that had a wide range tonal control(treble boost and cut), that could be used as a simple clean boost…through light overdrive….. all the way to heavier distortion. It uses junk-box type parts and is easy to get up and running. The only part that is a little unusual is the 5k tone control pot. I say this because ideally, it would have an anti-log taper. A linear pot will work fine. I like the sound and it can be tweaked in a number of interesting ways. Decreasing R3- will increase your max overdrive level, you can go to just two diodes instead of two sets of series diodes for clipping, R10 can be made larger( softer clipping) or smaller(harsher clipping). 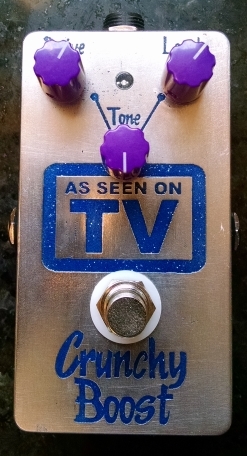 The tone control can be modded also. You can swap the pot connections to C6 and R8(wiper will now go to C6 and the high side connection will go to R8). This changes the curve some. 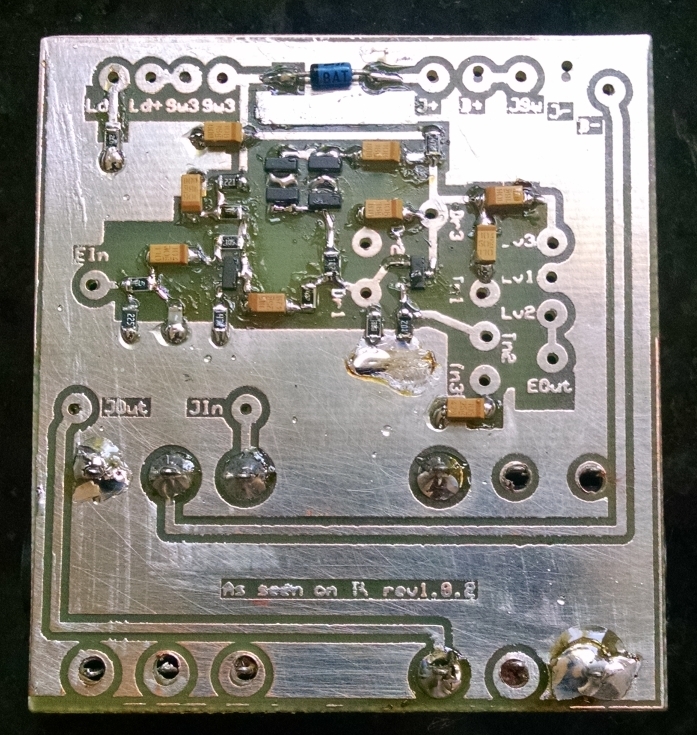 Another option is to tie C6 to the top of R8 and then connect c9(you may want to adjust this value) through the tone pot(as a variable resistor). This only gives treble cut but the overall gain is higher giving more intense distortion. 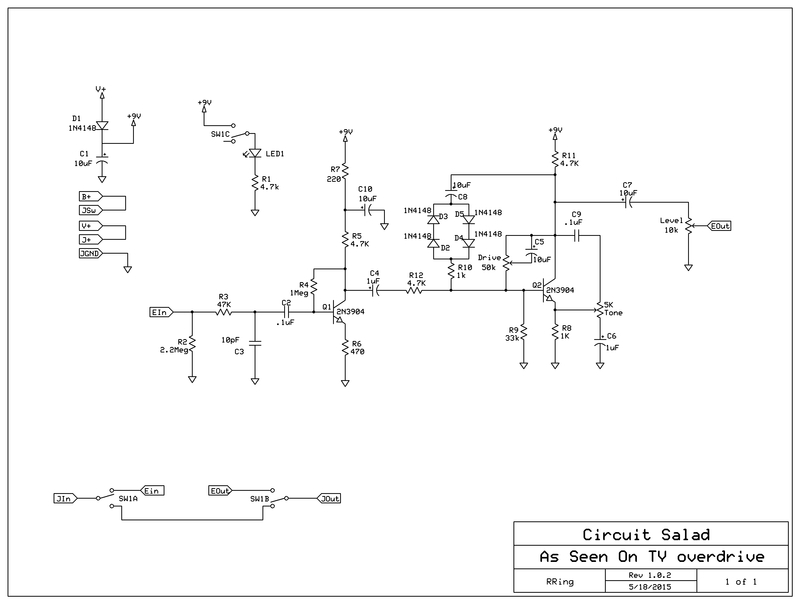 I have gone to 1N4148 clipping diodes and made a couple of other minor tweaks to the circuit. Overall I am happier with the sound particularly the broader range of partial clipping (more like an overdriven amp) in the lower gain settings. I am sure its all been done before……… but this thing sounds nice and is very easy to build. The distortion characteristic is very smooth. 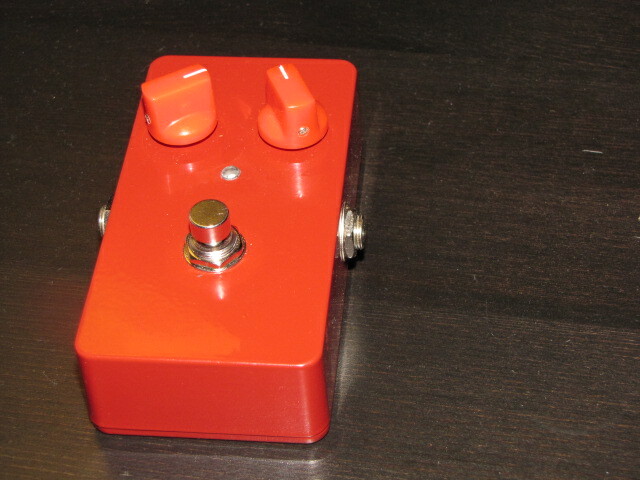 This is a really simple design for an overdrive pedal. My goal was very low noise, low power consumption and an overdriven amp type distortion sound. 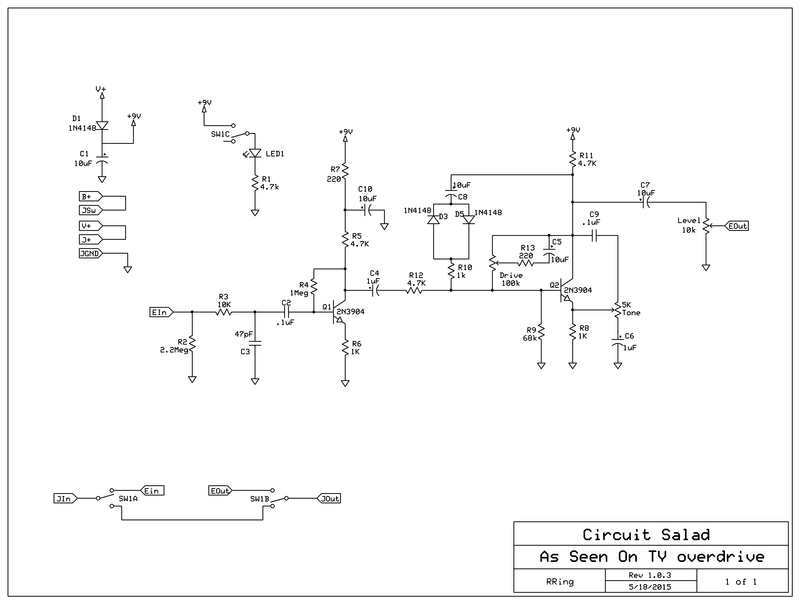 The circuit uses a very low noise OPA1652 to boost the input and control overdrive level. 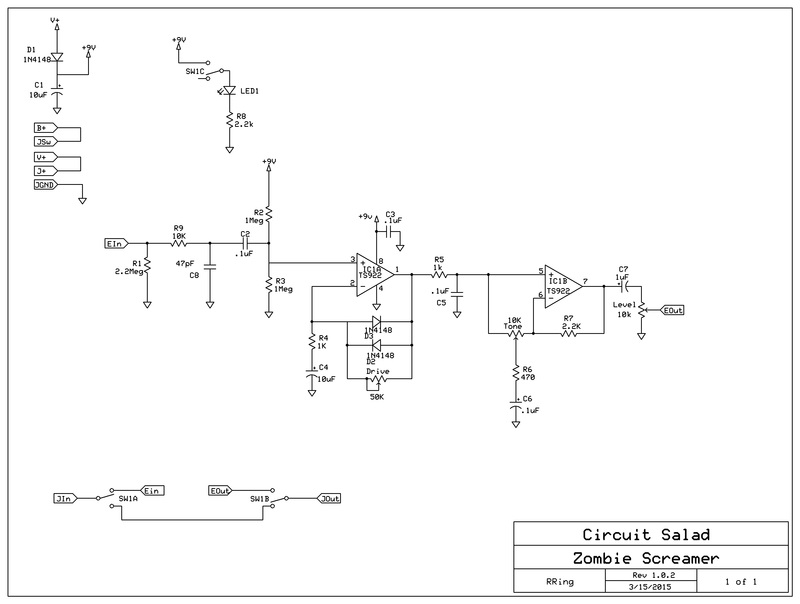 The signal then goes into a single voltage starved Jfet operated at 5 volts to create the distortion. The biasing of the Jfet is fairly critical, in order to make the distortion symmetrical. If other Jfets are used, one might have to tweak the bias resistor values. The pedal is very low noise and provides signal boost – all the way to heavy distortion. What I like about it most is that the pedal is very responsive to playing dynamics, allowing for subtle all the way to crunch type distortion depending on how aggressive you play lines or chords. 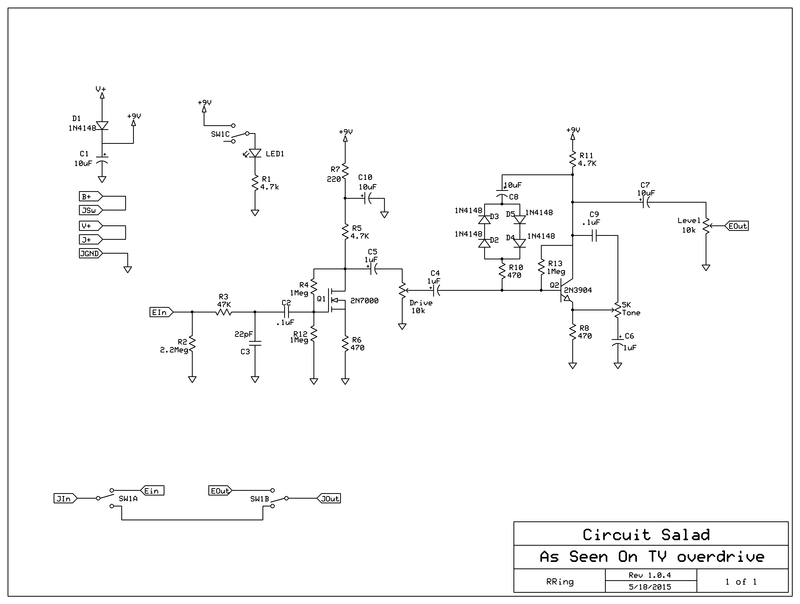 In the schematic, Q1 and Q3 are generic PMOS and NMOS fets- nothing special here – many will work. The PMOS is used as reverse polarity protection. The NMOS is for the LED activation. Also the 5v regulator can be anything – even a zener if you like.